Curated from the American Heritage Center collection, In Pursuit of Equality tells the story of three women, Nellie Tayloe Ross, Thyra Thomson, and Liz Byrd, who through their actions as elected office holders, challenged and changed the conventional understanding of equality in Wyoming. More specifically, it will look at Ms. Ross' election as Governor, Ms. Thomson's advocacy for the Equal Rights Amendment, and Ms. Byrd's struggle to have Martin Luther King Jr. Day recognized in Wyoming. The exhibition features photographs and three historic documents. It was curated by Matt Francis, Assistant Archivist at the American Heritage Center. Boyle Gallery Curated from the American Heritage Center collection, In Pursuit of Equality tells the story of three women, Nellie Tayloe Ross, Thyra Thomson, and Liz Byrd, who through their actions as elected office holders, challenged and changed the conventional understanding of equality in Wyoming. More specifically, it will look at Ms. Ross' election as Governor, Ms. Thomson's advocacy for the Equal Rights Amendment, and Ms. Byrd's struggle to have Martin Luther King Jr. Day recognized in Wyoming. 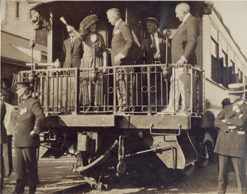 The exhibition features photographs and three historic documents. It was curated by Matt Francis, Assistant Archivist at the American Heritage Center. 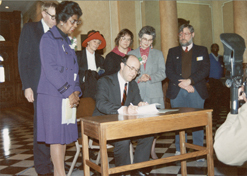 Left: State Senator Byrd attending the Martin Luther King Jr./Wyoming Equality Day bill signing, 1990. 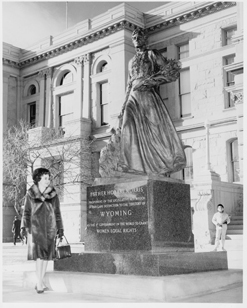 Center: Thyra Thomson next to a statue of Wyoming suffragist, Esther Hobart Morris, circa 1960s. Right: Nellie Tayloe Ross preparing to give a speech during an east coast trip, circa 1930.